First out of 6,420. Second out of 7,862. Third out of 7,361. Fourth out of 1,244 and 1,171. Joe McKeehen outlasting 6,419 other poker players to win the 2015 World Series of Poker Main Event was no fluke. With his third-place finish this month in the WSOP’s $1,500 Millionaire Maker — a tournament that attracted even more entrants than the tourney in which he rose to fame three years ago — McKeehen achieved a new level of confirmation of a very specific form of greatness. The 26-year-old from the Philadelphia suburbs just might be the very best in the world at navigating through seas of tables in the biggest fields live poker has to offer and being there with a chance to win when only one table remains. Phrased more simply, he might be the best giant-field no-limit hold ’em player alive. McKeehen has racked up nearly $15.5 million in live tournament winnings and two WSOP bracelets, plus he’s made three World Poker Tour final tables. And when he won the World Series Main Event in ’15, he put on the most dominant final table display since Greg Raymer more than a decade earlier, leading wire to wire. With 145 career cashes already outside the Main Event, there’s plenty of numerical evidence to suggest that McKeehen is the best world champion of the modern era. “To say anyone in poker is the best at something is probably a stretch,” counters poker pro Chance Kornuth, the founder of Chip Leader Coaching, where McKeehen is one of his fellow instructors. “The edges between the most elite players are too negligible to say anyone is the best. Kornuth makes a good point. There are too many variants of poker, too many forms of play, too many untrackable cash games and instances of Lady Luck intervening to definitively declare anyone the best. Even when Phil Ivey was at his peak and most experts labeled him the best poker player alive, it was a take that was nearly impossible to quantify. 145 career cashes, 19 of them outright wins. He wins 13% of his cashes. 14 more runner-ups. So 33 heads-up matches, he gets HU in 23% of cashes. 38 more 3rd-8th, or FTs assuming full-ring. When he makes the $, he makes FT 48% of the time. When McKeehen was in preschool, his parents, Brent and Gina, knew his intellect was something special, so they had him tested. The results suggested they should enroll him in private school, because the local public schools weren’t likely to sufficiently challenge him. It was a body blow to the bank account for the working-class McKeehens, but they did what was best for their son. McKeehen loved games from an early age — in 2010, as a teenager, he won what was considered the “world championship” of the board game Risk. Around the same time, he found poker. At 20, he took down a PokerStars Caribbean Adventure tournament for $116,230. 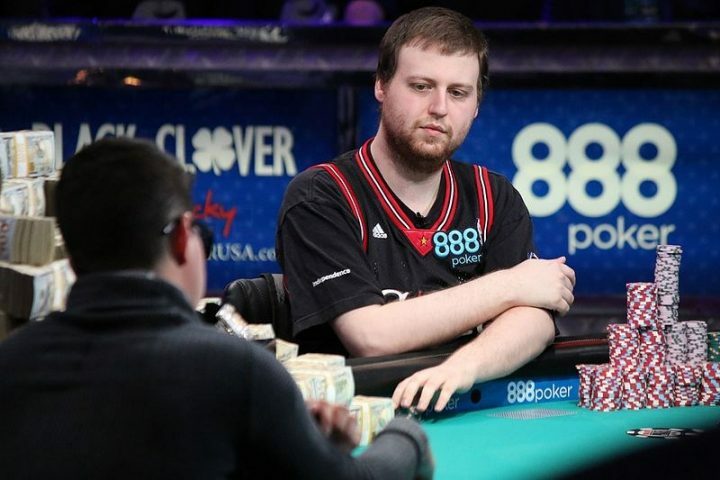 Two days after his 23rd birthday, he finished second in a 7,862-player WSOP Monster Stack event, earning $820,863 and creating a comfortable cushion in a bankroll that would explode with a $7,683,346 score in the Main Event the next summer. McKeehen is one of only two Main Event winners in the post-Chris-Moneymaker era — the other is 2010 champ Jonathan Duhamel — with career earnings outside that one tournament that exceed the payday for that singular win. What is it that sets McKeehen apart in these massive fields? Though you’d never guess it from his often volatile Twitter personality, McKeehen is almost un-tiltable at the table. If he takes a bad beat, sure, he’s prone to venting, but he doesn’t let it affect the next decision he makes. McKeehen has a sense of calm and a mental endurance that propel him in these tournaments that drag across several days of play. There was a time when Phil Hellmuth was in the conversation for world’s best large-field tournament player, and the rap on “The Poker Brat” was that his success stemmed from a unique gift for outplaying amateurs. The bigger the field, the softer the field, typically. And while Hellmuth had a reputation for struggling against his fellow pros, nobody was better at siphoning chips from those less experienced players who were just dying to make a chip-dumping misstep. McKeehen, however, doesn’t seem to have built his success on those same tendencies. Since his WSOP Main Event win, McKeehen has final tabled no fewer than eight pro-heavy tournaments with buy-ins of $25,000 or more. All indications are that McKeehen is a great tournament player, period, regardless of field size. But he does hold certain edges over certain types of players more commonly found when there are thousands of entrants. Maybe it’s a fool’s errand to declare with any authority who the best large-field poker player out there is. But it would be just plain foolish at this point to leave McKeehen out of the conversation. The Race Is On: Which US State Will Be Next To Legalize Sports Betting?